↑ His maps are lost but referenced in a letter by his nephew Jacques Noël, dated 1587 and printed by Richard Hakluyt with the Relation of Cartier's third voyage, in The Principall Navigations [...], London, G. Bishop, 1600. 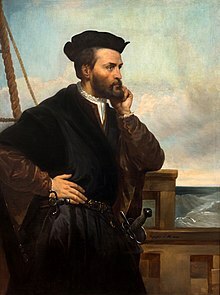 ↑ "Exploration — Jacques Cartier". The Historica Dominion Institute. Retrieved November 9, 2009. ↑ No baptismal certificate has been found, but Cartier stated his age in at least three letters. See Marcel Trudel, Histoire de la Nouvelle-France, Fides, vol. 1, p. 68.